We all make hundreds of decisions every day, but do you know why you make particular decisions? Well most people don’t. In this video I am going to share with you, the six scientifically proven methods, that influence our decisions, and how you can use them to improve you video marketing. In our ever increasingly busy world, we look for shortcuts to guide our decision making. In the classic book, “Influence: The Psychology of Persuasion”, Doctor Robert Cialdini, a Professor of Psychology and Marketing, identified that there are just six key principles or “universal shortcuts” that guide human behaviour. Influencing others isn’t luck or some sort of black magic – its science. There are proven ways that when used in an honest an ethical manner, will make your prospects say yes and help make your business become more successful. When you give something to other people they will want to give you something in return. Reciprocation recognizes that people feel indebted to those who do something for them. As a video marketer you must be the first to give. Use your videos to give your viewers valuable information, and if you can help them to solve a problem, they will be more likely to listen to your sales message. But it’s not just what you give but how you give. Make it personal – from you to them, and make it unexpected. The canned laughter you here on most sitcoms on TV is used as social proof that it’s a funny show. They use because it does works. It’s like we like to eat in restaurants that are full of people, we put a tips in a jar that already has money in it. When we are uncertain about a course of action, we tend to look to those around us to guide our decisions and actions. We assume that if lots of people are doing it, it must be ok. Especially if it’s our peers. In your marketing videos, include testimonials from satisfied customers. Show your target audience that people who are similar to them, have enjoyed your product or service. They’ll be more likely to become customers themselves. Being consistent is something we all strive for. It shows you are rational, trustworthy, stable and decisive. Inconsistency on the other hand, is seen as irrational, deceptive and indecisive. So how do we use consistency to help our video marketing? We use commitment. If we can get someone to make a commitment, even something as simple trying a free sample, you automatically trigger their desire for consistency which can trigger the “yes” response for a larger request later. We must be consistent ourselves with what we have already said or done. Make a public commitment to deliver your video content on a regular basis, then consistently publish your videos at the same time each week or month. People prefer to say ‘yes’ to those they know and like. We are also more likely to favour those who are similar to ourselves. Even something as ‘random’ as having a similar name as your prospects can increase your chances of making a sale. So one of the things that you can do in your videos is to honestly tell your audience that they are similar to your current customers and that you understand the audience’s challenges and their preferences. People tend to respect authority. They want to follow the lead of real experts. Business titles, impressive clothing, an office in a prestigious building are proven factors in lending credibility to any individual. Giving the appearance of authority actually increases the likelihood that others will comply with their requests. In your videos, use knowledgeable experts to support your business. If you are in front of the camera, display your own qualifications, dress for the part and pay attention to your body language. Physically show your confidence, speak with conviction and make strong eye contact to the camera. Be sure to establish your authority before making an attempt to influence their behaviour. It’s all about supply and demand. Basically, the less there is of something, the more valuable it is. The more rare and uncommon a thing, the more people want it. In your videos tell your viewers more than just the benefits they will get from your products but also what is unique and what they stand to lose if they fail to consider your proposal. People are more sensitive to possible losses than to possible gains. This is one of the strongest motivations in marketing. So in your videos switch your marketing message from your product’s benefits to emphasizing the potential for a wasted opportunity: You know what I mean… “Be quick or you’ll miss out on this never to be repeated offer”. So be sure to emphasize your product’s unique qualities to increase the perception of its scarcity. 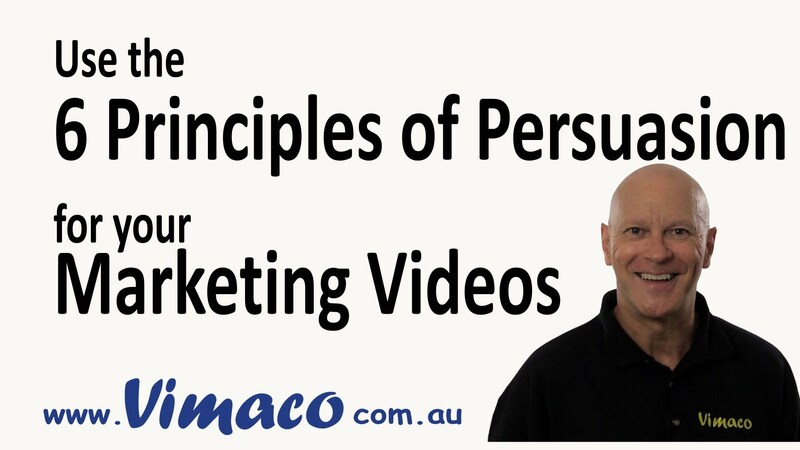 So there you have it – six scientifically validated principles of persuasion that you can use as part of your video marketing strategy.